Here you'll find the most beautiful scarfs to complete your outfit! 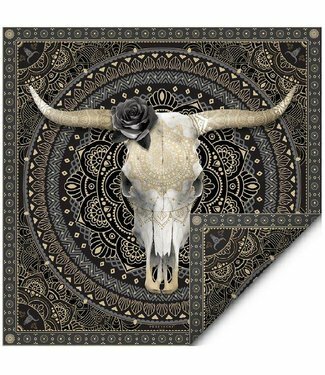 Gorgeous, 100% silk scarfs by Pôdevache with daring tattoo motifs or with large mexican skulls. These scarfs are printed in Italy in the same workshop where the Hemes scarfs are also made. Just look at these details....jaw dropping! awesome timeless suede scarfs by Treasures Design. The scarfs and capes with and carved perforations in the softest sheep suede are combined with studs and fringe. This label is the favourite of the jetset in France, Dubai and LA. Really a luxurious top brand! Silk scarf from the extraordinary PÔDEVACHE collection. The..
Suede shawl with a pattern of small handmade perforations an..
White suede shawl with a pattern of small handmade perforati..